It is a truly unique experience to see a city this large, with no cars, only water for streets, elegant arching stone bridges at every turn, and EVERYTHING moving by either boat, barge, or on foot. Narrow alleys between multi-story brick buildings that are barely wider than 2 people are important streets with names, shown on every map. You can walk down such a path thinking it will surely dead end soon, only to find it breaks out with no warning into a small square, surrounded by several shops, kiosks and busy restaurants. 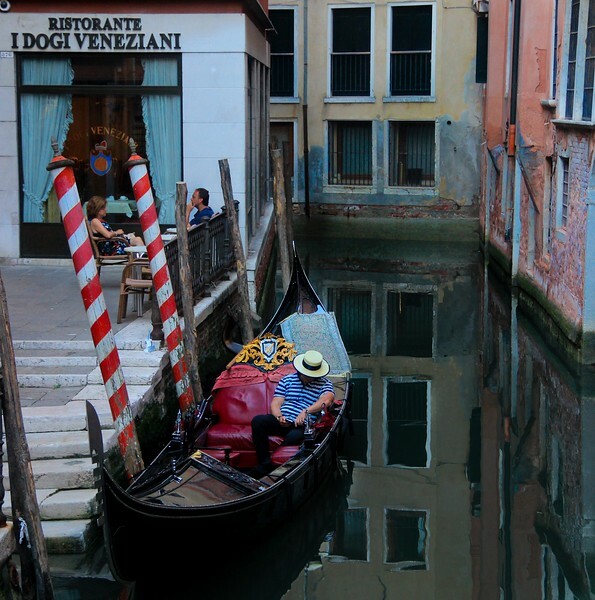 Give Venice a prime spot on your bucket list. Waters are quiet in this side canal as the sun goes down. Memories, memories. Your gallery brought back many memories of Venice. You've captured it the way I remember it. Excellent gallery, great photography.